The Mercedes-AMG GT S is a racing icon that is second to none. Pioneering athletics: With a top speed of 310 km / h and an acceleration from 0 to 100 km / h in 3.8 seconds, the Mercedes-AMG GT S leaves almost everyone behind. The AMG RIDE CONTROL suspension is adjustable in three stages - from comfortable to sporty tight. Other highlights include the electronic AMG rear-axle limited-slip differential and the additional "RACE" driving program for race-car-friendly design of vehicle systems. Far ahead: the front design of the Mercedes-AMG GT. Numerous elements of racing form a dynamic statement. The very long, far-down bonnet sets the direction. The AMG-specific radiator cowling emphasizes the athletic claim. The new design of the LED high-performance headlights and especially the new daytime running light design make the front of the Mercedes-AMG GT even more striking than before the facelift. The classic fastback design features LED rear lights with darkened elements inside. The redesigned rear diffuser with two double-trapeze tailpipe trims in high-gloss chrome underlines the dynamics. Increased safety at night and a distinctive, sporty and striking appearance are offered by LED High Performance headlamps. Thanks to LED technology, they illuminate the road better than conventional headlights - with lower energy consumption. The AMG Night package features selected exterior elements in black with a high-gloss finish. This results - depending on the desired paint color - in either strong contrasts or flowing transitions. Whether exciting accents or sovereign restraint: In both cases, you can demonstrate a sense of individual, dynamic design. The optional AMG Performance seats of the Mercedes-AMG GT S lay the foundation of maximum control with maximum handling from the sitting position. The strongly contoured seat shape with integrated headrests and AMG badge combines ideal lateral support during sporty driving with a particularly dynamic appearance. In this AMG steering wheel, fine Nappa leather meets non-slip DINAMICA microfiber for perfect grip and precise steering. The AMG signature flattened form is derived from motorsport and emphasizes the sportiness of the cockpit. Ergonomically positioned touch-control buttons offer intuitive user-friendliness and promote focused driving. The center console of the Mercedes-AMG GT S makes the interior of the sports car something very special. The stylized V8 arrangement of the AMG Drive Unit has been further developed with the facelift and supplemented with innovative display switches for selecting various settings. 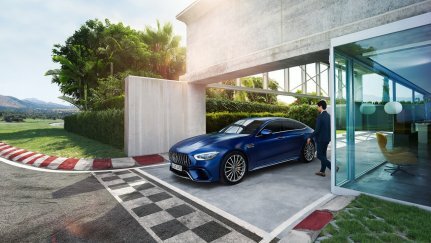 The control and display concept of the Mercedes-AMG GT S Coupé has been expanded to include a number of innovative elements. Touch-control buttons on the steering wheel and high-resolution displays set the standard in the segment. The digital displays and animations on the instrument and media display make vehicle functions easier to experience. Familiar strengths such as the intuitively understandable operating philosophy and the high legibility of all displays have been further enhanced.